As a prominent communications company, we are honored to have a team of master-mind techies meticulously working their network magic behind the scenes. Introducing, one of our keystone players: Wes Carpenter, otherwise known as our “Network Nexus”. Wes is one of our IT Department Ring Leaders – he brings a vast array of knowledge and skills to the table, and stays insanely busy with everything from equipment upgrades to software fixes. In his free time, Wes enjoys shooting, biking, hiking, and video games. He also appreciates Thai food and any meal he doesn’t have to make or clean up! 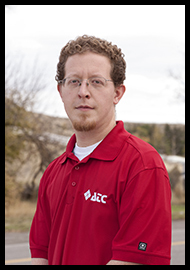 Wes has been with the company since 2006, and we’re very appreciative to have this quiet, witty, power-user on our ATC team!